Stepping off the bus in Jardin, felt like going back in time. It is a place where men still wear cowboy hats and ride horses into town; where the locals all know one another and the pace of life is pleasantly slow. 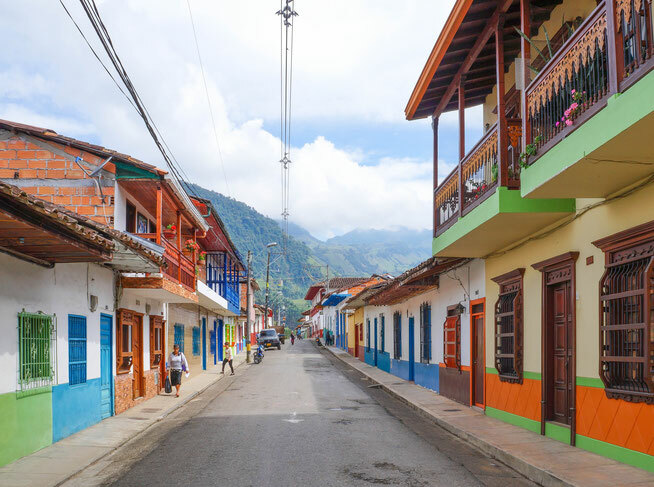 We instantly fell in love with this colourful little town nestled into the Colombian mountains; where we spent days discovering the best things to do which generally included meandering through the town and sipping delicious coffee in the mid day sun. We only planned on spending 2 nights here but ended up staying for 3 as we just couldn't leave! There are also some incredible hikes in the area as well as some of the best coffee we have had in all of Colombia. 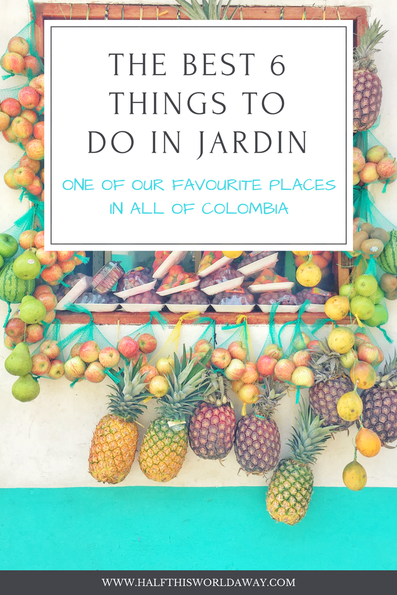 Despite being only 4 hours from Medellin, Jardin is off the tourist trail in Colombia which we loved as it meant there were hardly any tourists and we felt like we had this little town all to ourselves. 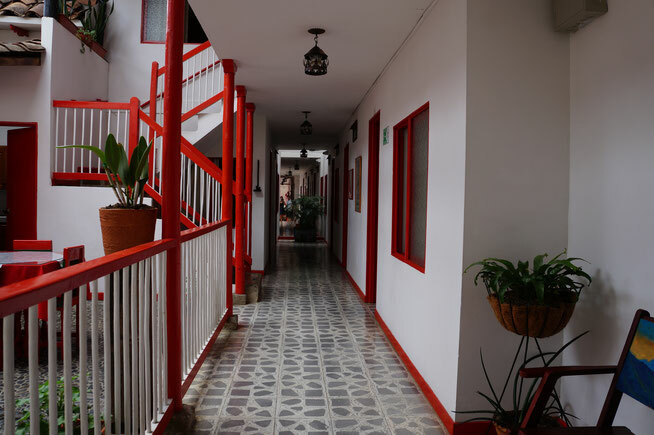 So if you are looking for the best things to do in Jardin, where to stay, where to eat and where to find the best coffee then you've came to the right place! 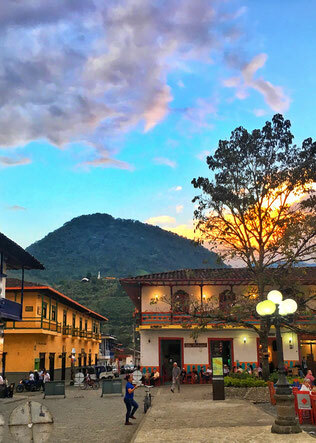 Every time we think Colombia can't get anymore colourful; we then discover a new place, somehow more vibrant than the last. 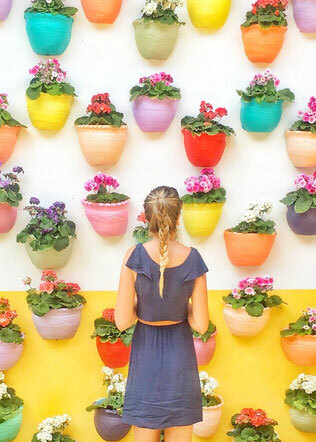 From Jardin's colourful plaza, where every chair is painted a different colour to the streets where each house seems to outdo its neighbour. 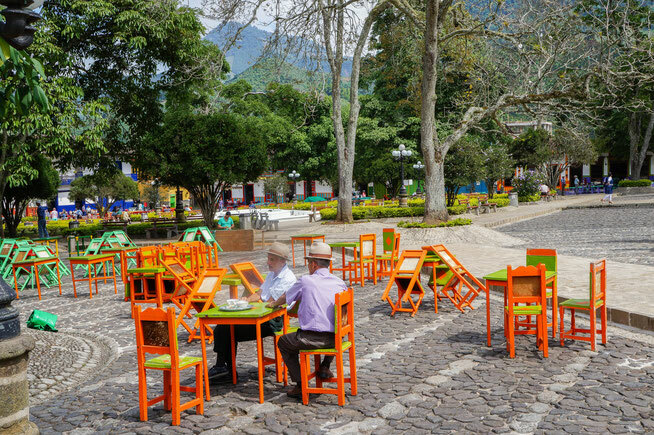 This was one of our favourite things to do, every evening we would buy a coffee para llevar and sit in the main square as the sun was setting and just watch the locals going about their day. 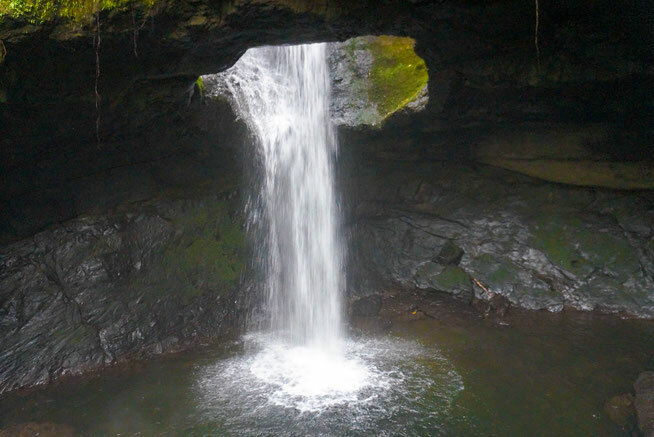 Hike to the Incredible "Cueva Del Esplendor"
Colombia is full of waterfalls, some significantly more impressive than others, however there is an incredible waterfall you can visit from Jardin with the unique surroundings of a cave. 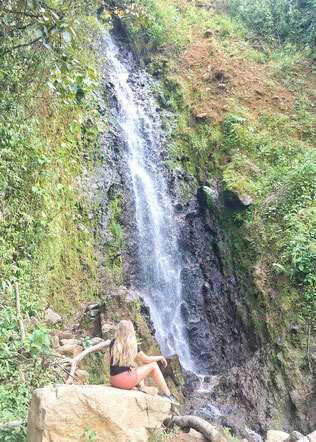 This waterfall ended up being one of the best we seen in South America. 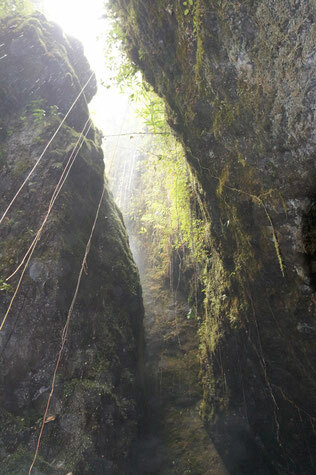 We done a tour here for 55,000 pesos per person with the tour company Cueva Del Esplendor. This tour company was great, they were super organised and the jeeps left their offices at 8am sharp plus they also gave you a little bag filled with water, cereal bars and fruit! The jeeps drop you at the start of trek and from here you will walk for about 30 minutes then stop for some refreshments. 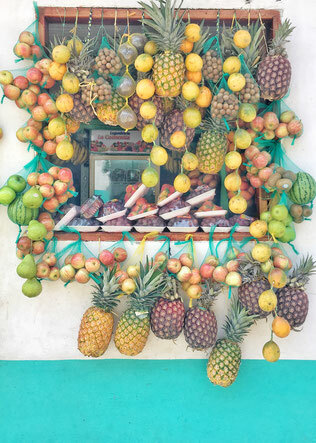 We had fresh juice and warm empanadas waiting on us! After this short break, you will then continue onto the waterfall. The trek is fairly easy and takes around 90 minutes each way. 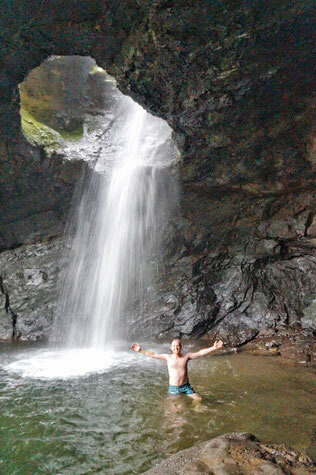 Once you reach the waterfall you can go for a swim; we done it and it was freezing! But a lot of fun! Remember to pack a towel and some warm clothes for when you get out. There are two cable cars in Jardin; one which was built for tourists but has been out of operation for the last 6 months (we have no idea when it will be fixed) or the original La Garrucha which was built by a local farmer to enable people who live in the surrounding hills, easy access to the town. This colourful, wooden and slightly unsteady cable car takes you up to a beautiful view point which overlooks Jardin. It only costs 7,000 pesos per person and at the top there is a little cafe which sells the best freshly squeezed orange juice! Top Tip: It took us a while to find La Garrucha as most locals pointed us to the one which was designed for tourists. To find the cable car then its on the corner of Carrera 9A and Calle 12. Drink Coffee, and lots of it! 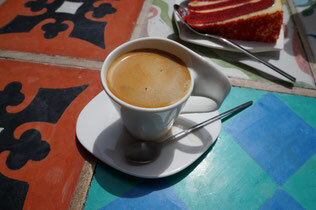 The coffee in Jardin was some of the best we had in all of Colombia. Cafe Macanas was the stand out coffee shop of which there are two in Jardin, although our favourite was the one beside the church. A coffee here cost as little at 1,000 pesos and they had the most beautiful garden which was the perfect place to take a few photos! 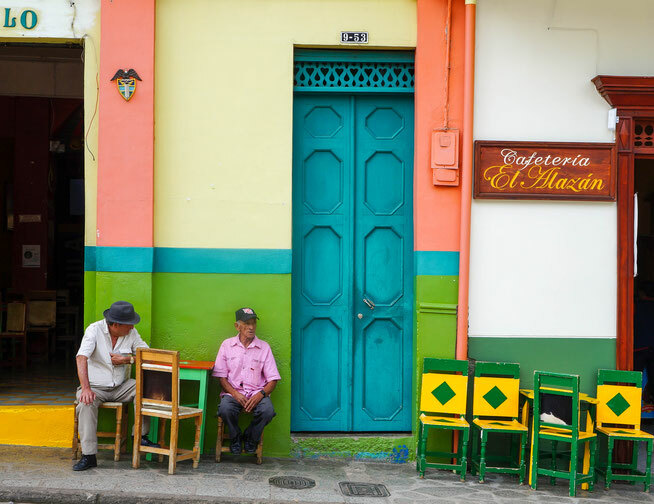 Top Tip: Cafe Macanas isn't the easiest to find as you need to go along a little corridor off the main square - to find the coffee shop then head to Cafe 1989 and its next door! Also, if you want a cake to go with your coffee then buy a donut from the shop on the corner of the square - they are delicious and only cost 500 pesos! 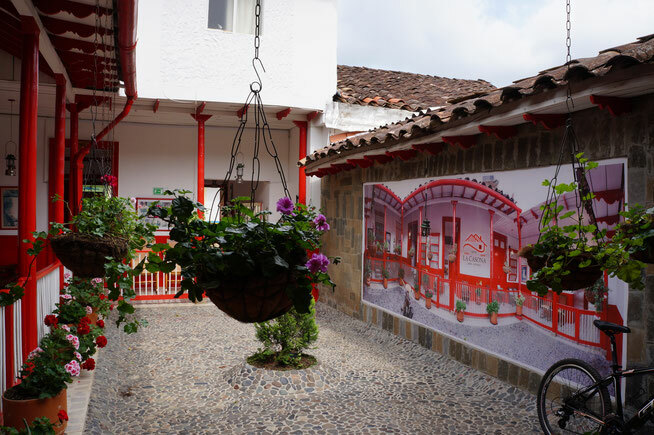 Jardin is famous for bird watching and at this reserve then you can see the Gallito de Rosa, a beautifully red bird which is critically endangered. The best time to go is at 4pm in the afternoon, you can get a jeepney from the main square and entry costs 10,000 pesos per person. We didn't do this whilst in Jardin however we have heard it is a great thing to whilst in the area, especially if you are interested in bird watching. Leading out of the town and into the hills of Jardin, is the most beautiful, cobbled street which is also the oldest in the town. If you follow along this path you will eventually end up at Cascasa Del Amor or The Waterfall of Love. Whilst the waterfall itself isn't overly impressive, the walk there is really beautiful to do in the evening. 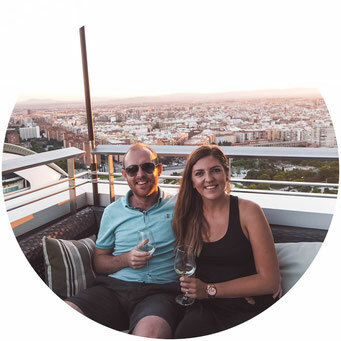 Even though Jardin is a little town; there are some great places to eat here and a surprising number of restaurants which offer international food. These are the best restaurants we found in Jardin. Cafe Europa was our favourite place for food in Jardin; this tiny little restaurant only has about 5 tables and sells Italian dishes, including pizzas and pastas. 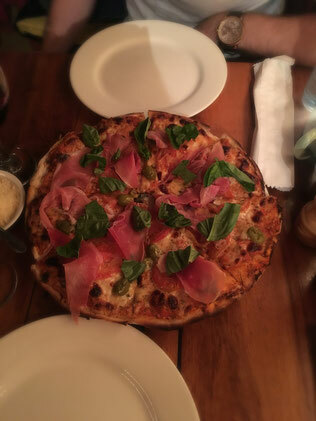 We came here for my birthday and shared a Serrano ham pizza and the Pasta De La Casa - amazing! We even treated ourselves to a bottle of red wine as well. This little restaurant feels cozy with its mismatched tables and dangling fairy lights. 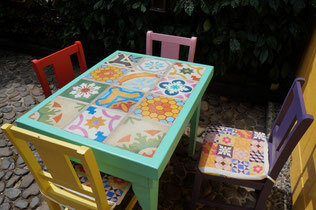 There is usually a queue outside whilst you wait on a table but it is an absolute must whilst in Jardin. On the night we went to Cafe Europa, it was also my birthday so we decided to go to a local bar for a couple of drinks afterwards. 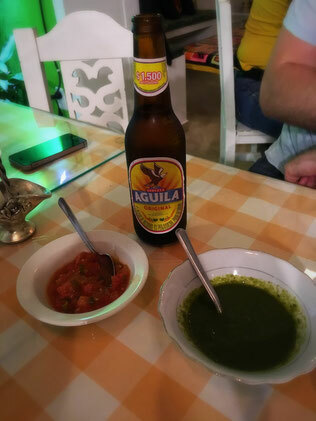 We found a typically Colombian bar, filled with locals salsa dancing. We were the only non-Colombians in the bar, but a friendly local bought us a couple of beers to welcome us there. It was a really cool experience being able to see what Colombian night life is like and feeling welcomed there made it extra special! This is another international restaurant with a varied menu; they have everything from pasta to noodle dishes and curries. Normally we would be wary of a restaurant which offered such a vast range of cuisines however the food at Bon Appetit was delicious! In particular, the pasta primavera was really good! 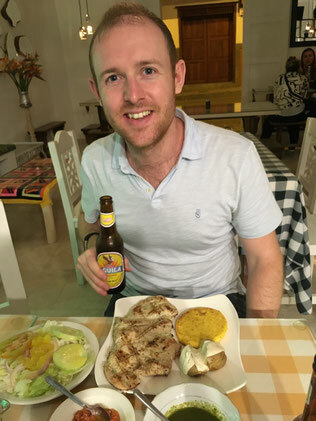 Las Brassas is a meat restaurant which sells a variety of different meat dishes with a range of typical Colombian sides including rice and salad. However, the meat was cooked to perfection and the dipping sauces which came with it were delicious! 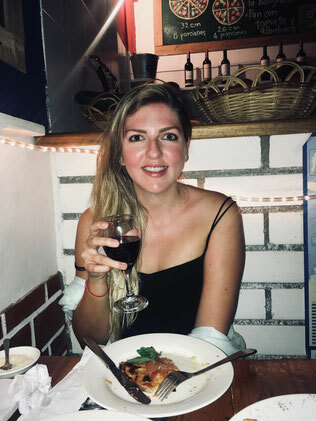 We stumbled upon Las Brazzas on our way to Bon Appetit and we're so glad we decided to give this place a go as the food was so nice! Cafe Cuchillas is in a prime location right on the main square and we had a really nice breakfast here. We opted for the pancakes which came with berries and nuts, and it was lovely being able to have breakfast outside and simply watch life on the main plaza. In Jardin, then we stayed in Hotel La Casona Jardin, a beautiful colonial styled hotel just off the main square. We loved the traditional feel of this hotel and the location was perfect. 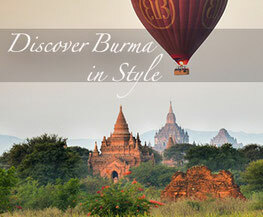 To check rates & availability on booking.com then click here. 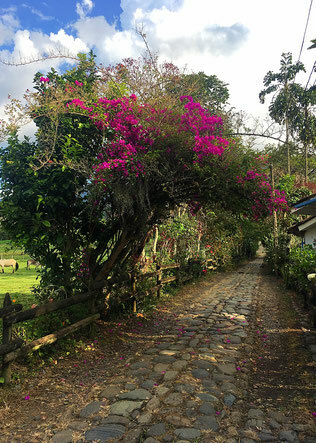 Jardin is a 4 hour bus journey from Medellin - to get the bus then you need to head to the Terminal Del Sur. We travelled with Rapido Ochoa whose buses leave from Terminal Del Sur several times a day and cost 26,000 COP per person. To check for tickets and times then click here. 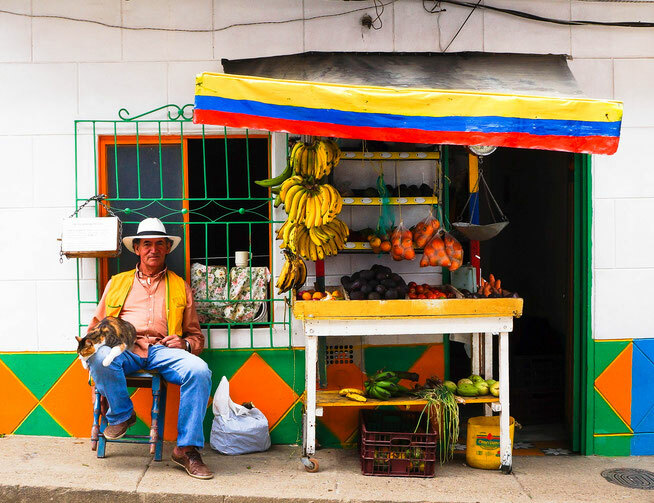 Top Tip: Please note, if you use busbud.com whilst in Colombia then the details for this bus journey are incorrect! On the website they tell you the bus leaves from Terminal Del Norte when its actually the Southern terminal. Don't do what we done and go to the wrong one! 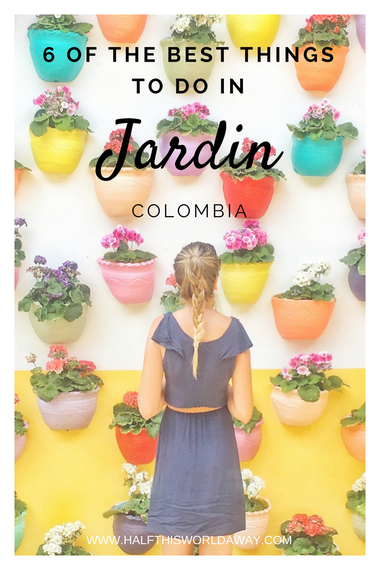 As tourism in Colombia continues to grow, Jardin will inevitably become more popular so we encourage you to go whilst its still a sleepy, authentically Colombian little town that is filled with locals, as opposed to backpackers. 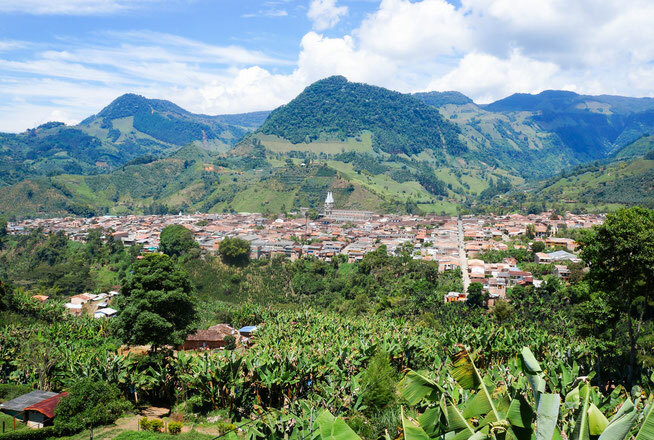 The Complete Guide to Guatape: "Home to the Best View in the World"